TIP – Probably more important than any other machine – the belly pan of a skid steer should be kept clean. Not too big of a job if done regularly. Q: My hydraulic oil level keeps going down & I can’t find any oil leaks? A: You will find at least one of your drive motors to be leaking into it’s chain case & it will be overfilled with oil. The motor should be removed to be repaired or replaced. Q: Why does my skid steer lose drive on on side when it gets to operating temperature? A: This is usually a symptom of loss of pressure & flow due to worn components. Specialized knowledge is required to repair hydrostatic systems. Unless you have a service manual & testing equipment, you will have trouble trying to repair this yourself, it may be time to call in the pro’s. Q: How do I adjust the tracking, so it will drive in a straight line? A: (Manual Levers) First check to be sure none of the control linkages have become loose. If all is OK, there are stop bolts/screws on the hand controls that can be adjusted to allow left or right levers to travel a little more or less – which ever is required. (Pilot Controls) – call the pros! Q: Can I adjust neutral to stop it creeping? A: (Manual Levers) Best carried out with all wheels off the ground. There could be a wide variety of issues here. Worn linkages, broken centralizing springs, broken transmission mounting bolts, worn dampeners, If you can’t see something obvious & are not sure what to adjust, best to call pro’s, as I have seen things get pretty messed up in this department…..
Q: Engine runs, but there is no drive! A: Likely a broken coupling or stripped shaft between the engine & transmission pumps. 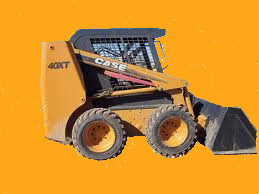 This entry was posted in Skid Steer, Troubleshooting Tips and tagged ALR, case equipment, cnh, earthmoving, Hydrostatic, ji case, machinery, service tips, Skid Steer, transmission repair, troubleshooting. Bookmark the permalink.